I had great fun with the May 2014 Club Stamp Set and a few other background stamps from Nina Crafts and thought that I will share with you how I created each of them. 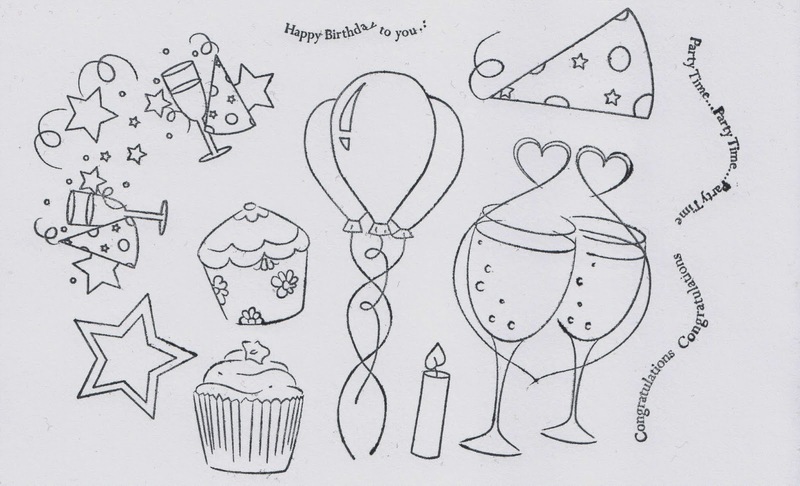 Here is a selection of the papers I created as well as some shrink plastic cupcakes as embelishments for a future card. I used VersaMark and Distress Inks to create these. This two background was created by pressing my distress ink pad on to my blending mat and working it from off the card in circular motion to centre of the card to create a fairly smooth colouration on the card. I then inked up the pattern stamp using the same ink pad and stamped it in a diagonal pattern over the card, making sure to re-ink the stamp everytime and then removing any excess ink before it was completely dry by buffing it with my blending sponge. On the second I experimented with a different pattern and White pigment ink for some more contrast. I inked up my text stamp with Versamark in and and stamped it repeatedly over the card, then I sprinkled detailed white embossing powder over this and heat embossed it. After this I pressed my distress ink pad on to my blending mat and working it from off the card in circular motion to centre of the card to create a fairly smooth colouration on the card as before, left it for a whilw and theb removed excess colour from the embossed areas with kitchen towel. This Background was created by pressing my distress ink pad on to my blending mat and working it from off the card in circular motion to centre of the card to create a fairly smooth colouration on the card. I then inked up the polka dot stamp using the a darker ink pad and stamped it all over the card, making sure to re-ink the stamp everytime. This background was created by pressing my distress ink pad on to my blending mat and working it from off the card in circular motion to centre of the card to create a fairly smooth colouration on the card. I then inked up the pattern stamp using the same ink pad and stamped it in a diagonal pattern over the card, making sure to re-ink the stamp everytime, this time I left the distress ink to dry completely leaving a more vibrant pattern. before stamping some White pigment ink for some more contrast and interest. I think this is one of my favourites as well as my favourite technique, you simply stamp your image randomly over the page in versamark and set it aside to dry, whilest making some other papers. After about 15 minutes I went back to the image and blended Distress Ink over it as before and then dabbed extra colour inside the party hats. This paper did not work quite as well as I hoped but I thought I would share it anyway incase it is something you would like to try. I took my squar acrylic block and inked it up with one colour then stamped it all over the card, left it for a few seconds whilest cleaning my block and applied another colour and then a yet again another colour. I started with the lightest and then used a blending sponge to yet blend the colours to create a softer look, thinking back I shouls have used less yellow and waited for the colours to dryu a bit more before blending and it might not have been so muted. Hope you enjoyed this post, I will be posting some cards I made using these shortly but in the mean time here is some other cards I made using the May Project Club Stamp Set.